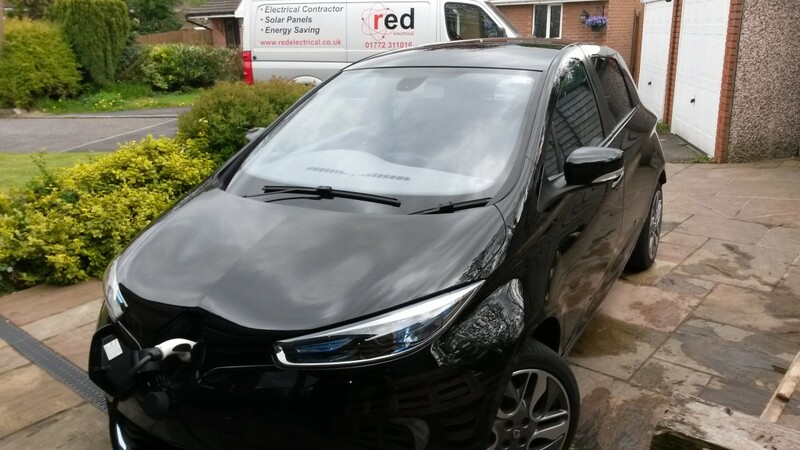 Our new Renault Zoe plug-in car, plugged in and charging at home for free. I’m always being asked about ways to increase self-consumption of solar electricity. There are several commercial options on the market, and I have already fitted an iBoost that heats up the cylinder with surplus generated electricity. Every now and then and for various reasons (environmental, financial and geeky) I get obsessed with the idea of owning an electric vehicle (EV). The EV market isn’t yet mature enough to produce a van that would suit my requirements, so for the foreseeable future I’ll be using the big VW. It’s a BlueMotion model which is as eco-friendly as a large fossil burner can be, and that will have to do for the time being. The family car doesn’t do very many miles, mainly the weekly grocery shopping and evening and weekend use. This got me thinking – if I could design an EV charging controller that could divert the surplus electricity into a car, rather than an immersion heater, an electric car would be better for us than the petrol car that we had. So that’s what we’ve done – the petrol car has been traded in for an all-electric Renault Zoe. We’ve had the car for a month and so far we’re delighted with it. The torque from standstill is very impressive and there are plenty of gadgets to keep a techno-geek like myself happy. We’ve had a couple of Sundays out and the 100 mile range hasn’t been a problem, partly thanks to a quick pit stop at Ecotricity’s free rapid charger at Chester service a couple of weeks ago on the way back from the Zoo. Once I’ve finalised the software I’ll put it in an enclosure and mount it next to the consumer unit. Not as pretty as some of the commercial ones, but it does the job and cost less than half as much! As the car is an ex-demo, we weren’t entitled to a free charge point installation. Not that I’d have been that comfortable having a stranger meddling with my house electrics anyway! The pressure was on to have a charge point fitted before we picked the car up from the dealer. I did a bit of research and designed and built a charge point for the car that will make surplus generated electricity available to the car’s on-board charger. It’s still a prototype but after many hours of research, design, trial and error, is working well. For those that are interested, I built an EV charger using a Mainpine Electronic Protocol Controller (EPC) from EVBitz.uk. The EPC has a resistor input that tells it the maximum charge current that the EV’s on-board charger can have. I then built a controller. 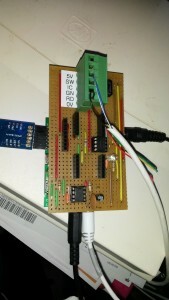 This is a partly-built eMonTx v2 from openenergymonitor.org with a ‘shield’ on top. 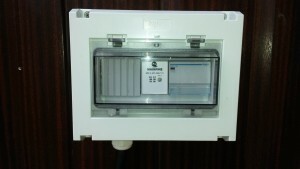 The shield has a digital potentiometer so that it can set the charge current on the EPC. For times when the vehicle needs charging quickly, there is also an override button to cycle the charge mode between excess PV only, minimum 9A, minimum 16A and minimum 32A. The charger also uploads its information to my server so that I can monitor it. I’m also planning to add in some form of smartphone control so that I can set the car charging when I am away from home. When it’s all done I’ll put it in an enclosure next to the consumer unit.